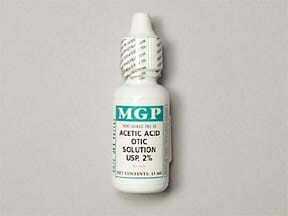 Use this medication in the affected ear(s) as directed by your doctor, usually 3 to 4 times daily. Use in the ear only. Do not use in the eyes, swallow, inject, or inhale the medication. Before giving this medication, thoroughly clean the ear canal as directed, and remove any crust or other material. Then wash your hands. To avoid contamination, do not touch the dropper tip or let it touch your ear or any other surface. Lie on your side or tilt the affected ear upward. Hold the dropper directly over the ear, and place the prescribed number of drops into the ear canal. To help the drops roll into the ear of an adult, hold the earlobe up and back. In children, hold the earlobe down and back. Keep the head tilted for about 2 minutes, or insert a piece of cotton if your doctor directs you to do so to keep the medication in contact with your ear canal. Repeat for the other ear if so directed. Do not rinse the dropper. Replace the cap after use. Use this medication regularly to get the most benefit from it. To help you remember, use it at the same times each day. Continue using it for the full time prescribed, even if symptoms disappear after a few days. Stopping this medication too early may allow bacteria to continue to grow, which may result in a return of the infection. Tell your doctor if your ear symptoms persist, worsen, or return after stopping this medication. Avoid contact with the eyes. If you get some of the medication in the eye, rinse the eye with a steady, gentle stream of tap water for at least 15 minutes. Tell your doctor if the eye becomes persistently irritated or your vision is decreased. What conditions does Acetic Acid Solution, Non- treat? 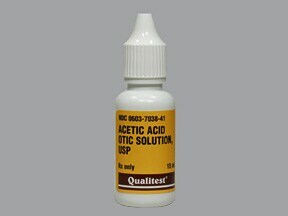 Before using acetic acid, tell your doctor or pharmacist if you are allergic to it; or if you have any other allergies. This product may contain inactive ingredients, which can cause allergic reactions or other problems. Talk to your pharmacist for more details. During pregnancy, this medication should be used only when clearly needed. Though the risks are probably small, discuss the use of this medication with your doctor. What should I know regarding pregnancy, nursing and administering Acetic Acid Solution, Non- to children or the elderly? This medication has been prescribed for your current condition only. Do not use it later for another ear problem unless told to do so by your doctor. A different medication may be necessary in that case. For certain ear problems, it is important to keep the affected ear(s) clean and dry. Try not to get the affected ear(s) wet when bathing. Avoid swimming unless your doctor tells you otherwise. Consult your doctor for more details. 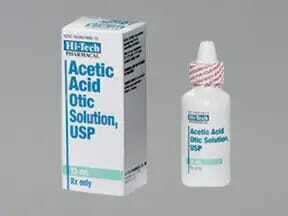 Are you taking Acetic Acid Solution, Non-? Are you considering switching to Acetic Acid Solution, Non-? How long have you been taking Acetic Acid Solution, Non-?